the subject matter was really heavy for it's time too . Be careful what you wish for. This is one of the most saddest and best episodes. for any situation just in case . Always be prepared no matter what . This is definitely an educational episode here too . The Shelter. Back to back nuclear attack episodes. Lots of these themes. Big deal then, and now. Absolutely true gbone a very spot-on response here too . Imagine putting your life on the line on a pool game. My son got me this for Christmas. to be famous no matter what . IMPO - It just doesn't seem worth it . That's so cool gbone ! Does she really talk also ? If so hopefully nothing mean or creepy there . It’s so small it’s only 3 inches. It’s the thought that counts. no talking thank god. Looks cool left in package. Never been a fan of The 7th is Made Up of Phantoms. No moral to learn. Just an uninteresting time travel story. Well, I was a lurker over at IMDB for a decade or so and always followed along with the boards during the marathons. I always found it interesting to see what other people thought of each episode in comparison to my own opinions. So I liked to follow along and read those opinions -- and learn a lot of new facts -- but I never thought of posting. New Years Eve and day used to be pretty chaotic with gatherings, parties and the like. After a major life event a couple of years ago, I found much more time to spend online. Then, last year, after all those years of lurking, I finally decided to register and contribute (some of you may remember me as one of a handful of folks posting every upcoming episode in real time with excerpts of each episode including all cast members, etc). Well, we closed down about 3 or 4 threads last year and I had a ball contributing and learning from everyone. Then 2 months later the IMDB forums were gone LOL! Anyway, nice to see one or two familiar usernames here. I doubt anyone will remember me from there since I only started posting last New Years and I deleted my account when Col posted the closing notices, but if you do remember me, feel free to shoot a PM to say hi! A timid bank clerk acquires the ability to read other people's minds. but would not want to read other peoples personal thoughts . makeup job by the memorable William J. Tuttle .
" Life is pretty life is fun I am all and all is one ! " YIKES ! No thank you I like being weird and different here . ( however still an excellent episode and lead memorable actor Martin Balsam ) . 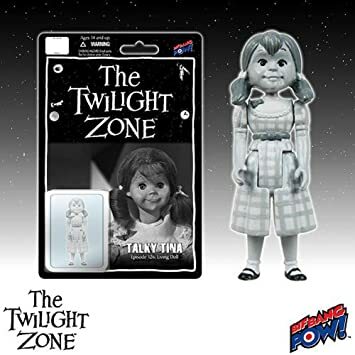 I sometimes back to back this TZ episode on DVD with - Nothing in the Dark . with one of my top favorite memorable actor - Rod Taylor . from your colleagues is just not cool . A real forever tear jerker for me here . then everything between them would have been perfect . but doomed to repeat itself . A good storyline episode just the same . I’m done folks. It’s been fun. Back to reality tomorrow. Talk to you in 6 months on July 4th. 😀 kidding hopefully not. Have a good new year. This was fun!! the devil bobble head in Nick of Time always freaked me out as a kid. and chat with you here again on this forum too . Have a great evening and new year as well .